Out with the old and in with the new! Senzafine, has moved to its own sim and is having a sale on all in-store items including our new fitted mesh sizes. The Re-Opening Sale will take place from August 22nd and end on Midnight August 28th. We will be holding a raffle and some giveaways on the 22nd (yay my birthday). Also, our best sellers in standard sizing will be pulled out during the event as a final farewell discount sale. Clearance items in standard sizes will not be available for sale after the event and most other standard sized products will be moving to marketplace only. Sale does not start until Midnight going into the 22nd but you are free to come explore the sim before then! A new release is out for We Love RolePlay’s current round! Senzafine’s release at the event is the Lothíriel dress, a brand line of gowns for the fair and lovely ladies! The dresses are color matched as closely as possible so that you can use the Aesbrennil shoes with them (as is the case with the Beriawen separates and Deorwyn gowns) for ease of use. This dress comes in 4 separate HUD color packs, with each pack holding 4 colors each with gold and silver trim options. All color packs come with a super awesome Ribbon HUD with many more options. The Ribbon HUD allows you to choose ANY of the offered colors from all 4 color packs in Gold or Silver embroidery options as well as controls to hide or show the ribbons, should you so choose. The dress comes in the usual 5 standard sizes plus 2 fuller sizes for those with more curves so stop by the event to try out a demo. Each pack is on special introductory sale price of L$325 (25% off normal pricing) so hurry before the month is over! 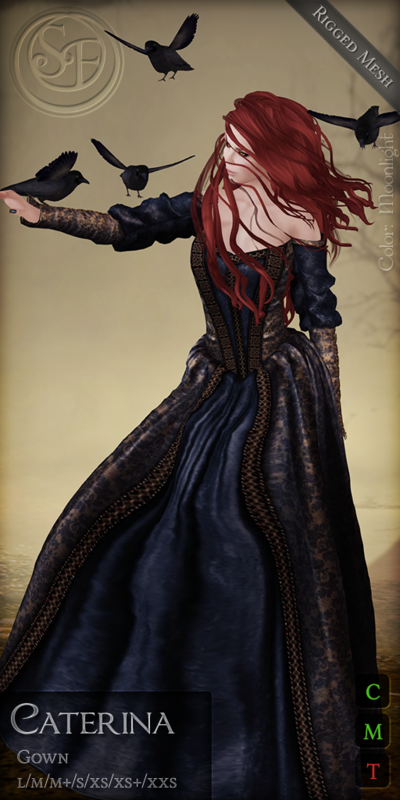 Visit our booth at We Love RolePlay (WLRP) in-world to try the demo and fall in love (we hope) with this new dress! If you miss this, they will be released to the main store in under the full price (so hurry and get it at discount). As a reminder please note that we have a new Senzafine store location. New release for Genre’s round theme of Twilight Zone! Senzafine is featuring a brand new line of Mesh Eyes called “Under the Milky Way” which are surreal and best of all, animated! Stop by the event and check them out (animated display will be available in the main store to see the effect if you can’t get into the event). Each pair of eyes are sold separately at Genre for L$75/ea. Be sure to stop by at Genre in-world to pick up a pair! If you miss this, they will eventually be released to the main store in full release form. In-world demo displays are both at the event as well as the new Senzafine store location. To continue our short series of posts, we bring you past releases of Summer 2015. This season starts from the calendar in June and lasts to mid or late September. Behold! A summer seasonal 2015 look at product releases that never made it to the website individually! See anything you like (that isn’t noted not released yet)? Come visit Senzafine to shop in-world today! Aug 2015 – Genre: Dragons! To continue our short series of posts, we bring you past releases of spring 2015. We start from the calendar seasonal beginning in late March. Behold! A spring seasonal 2015 look at product releases that never made it to the website individually! See anything you like (that isn’t noted not released yet)? Come visit Senzafine to shop in-world today! I will start off a short series of posts by showcasing past releases for Winter 2014 and 2015. I figured this to be a way to show you whats been going in past releases on without inundating everyone with too many posts or posts that were too long. Behold! A winter seasonal 2014 (and early 2015) look at product releases that never made it to the website individually! See anything you like (that isn’t noted not released yet)? Come visit Senzafine to shop in-world today! I’m a bad bad designer lol. I haven’t updated the site in so long and I apologize! I’ll try to do monthly posts going forward as release roundups until time frees up more. I hope to put a catalog function on the site so that I can get some backlog items done without having to bore you with blog posts. ;D It’s gonna be a work in progress. Onto the news! It is with a sad heart that we must say farewell to Port Seraphine. Due to money constraints, our lovely Sim hostess, Nephilaine, will need to part with it later this month, unless some sort of miracle happens. Senzafine and Paper Moon have each found homes in new sims and once I hear from the other stores I will amend this post. Senzafine’s new and likely temporary home (6 or so months) will be housed and sharing space on the same sim as one of my friend’s new stores (not yet open) and will move with her should she expand to a full sim. Paper Moon has moved onto one of the sims for rent from the gals who run Enchantment event and she is settling quite comfortably thanks to their efforts of making her welcome. I find this a new chapter in Senzafine and the store been through so many other chapters before. I figure that if I should move to a new sim, let us reinvent Senzafine with a new look. The store is currently set up in a temp skybox but I am working on a cute skysphere store that will have elements of fantasy, vintage and perhaps a bit of the surreal. I have always wanted this shop to be a reflection of fantastic items I make that my whim carries me with.. usually clothes or furniture I cannot find or otherwise afford RL. Isn’t that the case with most designers? I just want to remind my dear shoppers that Senzafine, though perhaps going through specific styles for months at a time, wont always adhere to those styles every release. I happen to love fantasy very much due to reading it voraciously as a kid, but its not the only thing I love. I love a great deal of beautiful things in this world and I get inspired by it all! I look forward to bringing more wonderful pretty things to make you smile and enhance your SL experience! A Tattered Page [*citation needed] is a brand new event brought to you by the lovely people at Cursed Events. The objective is to read a original literary work that is announced a month or two in advance. The designers participating then read the work and choose an aspect of the story that inspires them, creating one or more products that relate to the section. The citation needed part is that the designers must provide a notecard within the product that cites the part of the book that inspired their work. A minimum of 1 product is to be an exclusive product or exclusive color (merchant’s choice) that will not be featured for sale again after the event. Reading through the book, my heart went out to Justine Moritz, who was one of the many innocent victims of Frankenstein and his decisions. Justine was wrongfully framed and accused of William Frankenstein’s murder. The real murderer being Victor Frankenstein’s creature. A special thanks to the creators at Pale Empress for providing such beautiful and poignant pieces to complete a somber look. The Hair, Dress and tear-stained makeup layer can be purchased at Pale Empress. The event takes place at each store, although we have created a shopping guide full of all the important information, including photos of the products. Teleport to Senzafine: In-World Main Store or View the Shopping Guide to see the inspired works by other creators who are participating! The same day The Fantasy Collective opened, so did The Seelie Court’s new round. The theme was “Unseelie” to go along with the spookiness that is Hallow’s Eve. I took this theme for a fantasy RP spin with some makeups inspired by dark elvish folk. The “Underdark” lipstick line comes in three 5-packs with colors I interpreted to represent 3 different alignments: Good, Neutral and Evil. They will be at the Seelie Court until Monday, November 10th! Senzafine was invited to take part in the Fantasy Collective last month, marking their anniversary. They created a very fun theme that allowed people to be imaginative in all the fun ways there are available at a RL Renaissance Faire. For this one, I wanted to stick to the theme of the Renaissance dresses you always see the court ladies wearing at these faires. It has a very fairytale quality about it with the color combos used being so vivid and at times a bit otherworldly. The dress here is called Caterina and it is available only at the Fantasy Collective until the 15th. It wont be in the store until January so get hoppin now!